In many cases, we see institutes, governments, and businesses involved in internet censorship. It is the suppression of what can be viewed or uploaded on the internet. Some governments do it so that it helps them with their propaganda. Some businesses do it to deny the general public of facts. The range of internet censorship varies from nation to nation. Democratic nations have some minimal internet censorship. Some governments have no problems with censoring at all. These countries block news and discussion over the internet. Censorship is also used in the events of protests. Riots and violent outbreaks can also bring in internet censorship. Elections are another event where internet censorship is considered. The problems faced with internet censorship are somewhat like the problems faced with the censorship of books, newspapers, television and film, radio and music, and other forms of media. However, since physical authority cannot be put on all websites, some methods are used for censorship that is unique to the internet. Examples of some of these methods are content filtering and website blocking. Governments, institutes or businesses usually do website filtering and blocking. Some countries filter potentially provoking content or sensitive content. It is very rare that an organization would have complete control over all the computers connected to the internet. Therefore, it is possible to unblock blocked websites and access the content that you need. If you accidentally deleted a photo or video file downloaded from a blocked website and just want to recover it from your computer, it would be very convenient to get the file back with a free photo recovery software. Blocking of IP Address – Sometimes a certain IP address is denied access. As a result, the website which is blacklisted will be blocked. At the same time, if there are websites on the same server shared by the blacklisted website, those websites will be blocked too. Typically, geo-blocking is applied through blocking of IP address. Domain Name System Filtering – DNS filtering is another method of censoring the internet. Blocked domain names cannot be accessed. Uniform Resource Locator filtering – Scanning of URLs takes place in this technique. URLs with unfavorable keywords are blocked. Packet Filtering – TCP packet transmission is terminated as soon as unfavorable keywords are found in this technique. As a result, internet censorship is caused. There are many ways one can access websites that are blocked in their country, region or institution. We have listed the most popular ways to deal with internet censorship. A VPN extends a private network across a public network and allows users to access the internet freely. Benefits of VPN are security, functionality, and management. It started as a tool to help with corporate applications and resources. Security is ensured by private connection which is processed via encrypted layered tunneling protocol. Passwords and certificates are used for authentication purposes. A virtual connection makes VPN via virtual tunneling protocols, dedicated connections or traffic encryption. A proxy server is a server that acts as an intermediary. A user that connects to a server via a proxy website can gain access to blocked websites. It provides anonymity and can counter IP address blocking. In an event where the server filters content based on the origin of the request, circumvention is possible using a proxy website. IP-based restrictions can be bypassed through a proxy server. Users can also circumvent proxies which filter using blacklists. Sometimes, institutions that block websites only block the URLs of the websites. So, one can use the IPs instead of the URLs to gain access to these sites in such events. IP address of any website can be discovered using the Command Prompt. All you need to do is to type “ping websitename.com” and the IP address of the target website will be shown on your screen. Then type that IP address in the address bar of your browser and hit go. The URL-blocked website should open successfully. However, it must be noted that sometimes IP addresses are blocked too. In those cases, using IPs instead of URLs won’t bear any fruit. Many browser extensions connect you to a safe proxy server or VPN to allow you to gain access to blocked websites in your region. These extensions are easily available. A lot of such extensions can be found for Google Chrome or Mozilla Firefox, two of the most used browsers in the world. Extensions like the Kproxy browser extension and ProxMate are two examples of such extensions. These extensions work like a proxy website, maintaining anonymity and security. IP anonymizer like the Tor Browser can be used for maintaining anonymity and to bypass blocked websites. Tor Browser is very popular among privacy enthusiasts. It also allows access to the dark web websites. 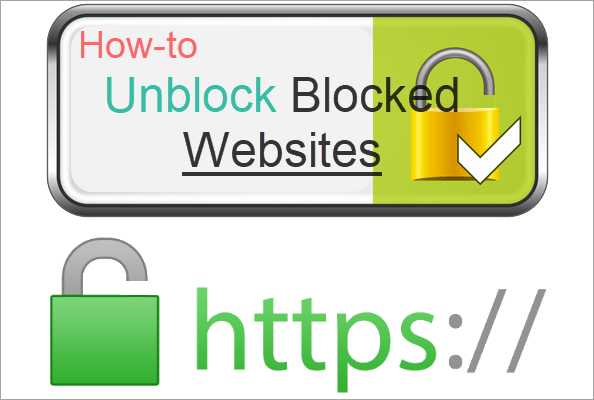 There are many other ways to bypass blocked websites. The tools of fighting against internet censorship are rapidly evolving. Kindly share the methods that you like with us!